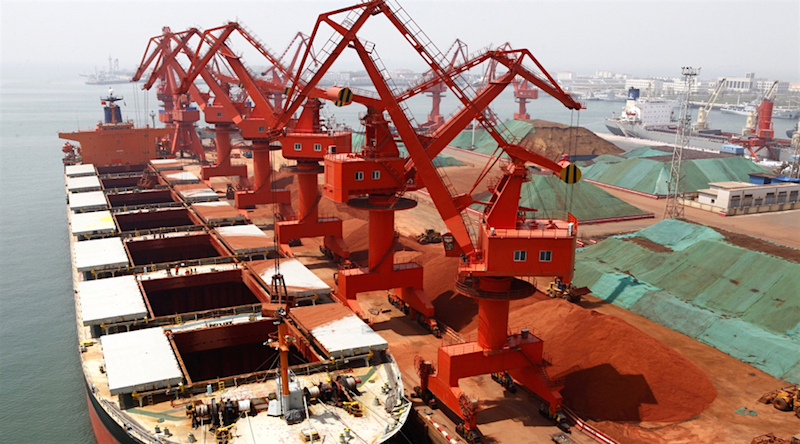 Doom and gloom; but is it all bad news for dry bulk in 2019? 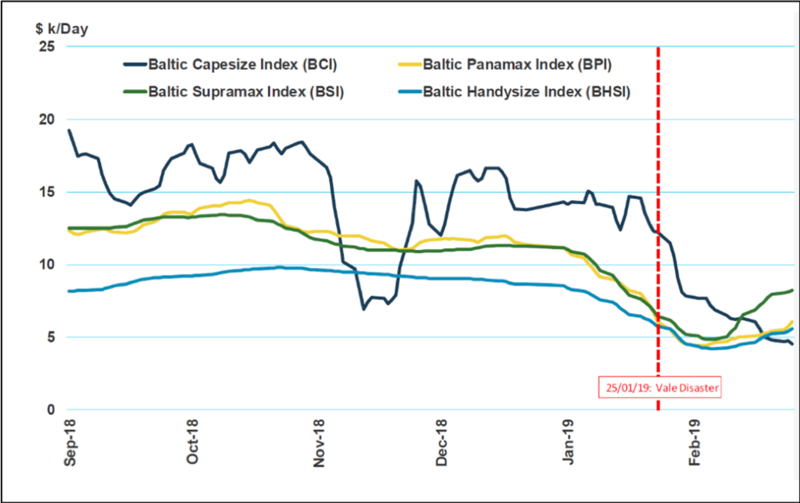 Chart 1 shows the pace of the decline in vessel spot charter rates, as measured by the Baltic Exchange; by early February, spot TCE rates in $/Day barely covered vessel operating costs of around $5-7 k/Day. Panamax earnings dropped 30% mom in January; on only six occasions since the start of 2010 has a mom fall in Panamax earnings been larger. This also applies for the Supramax benchmark, whilst the Handysize mom drop of 23% is even rarer by the same comparison (with sharper falls seen on only two occasions since 2010). It is important to recognise that sub-Capesize rates started to decline early in January, well before the disaster at Vale’s mine near Brumadinho on January 25. It is also important to note that factors other than Chinese coal imports and Brazilian iron ore also conspired to drive markets lower early in 2019. Importantly, many of the factors were seasonal, such as Lunar New Year. In addition, soybean trade has been far weaker yoy due to the loss of US shipments to China. On the supply side, January saw a short-lived spike in vessel deliveries: in total, 4m dwt was delivered, the highest since February 2018. This far outweighed 0.8m dwt of vessels scrapped. We’d expect limited short-term downwards pressure on rates as a result, the effect of which will soon dissipate. One major support to the sub-Capesize market in the near-term will come from soyabean trades. MSI continues to expect strong demand for soyabeans in Q2/3 this year as the usual seasonal uptick in Brazilian exports coincides with a stronger than usual second half of the trade year from the US (March-August), thanks to a build-up of unsold soybeans following a weak first half without Chinese buying. The negative effects of weaker demand this year will be somewhat mitigated by the adjustment to the MSI supply-side outlook. Whilst we expect 2.5m dwt more new tonnage to be delivered this year than in our Q4 2018 update, we have increased our scrapping forecast by almost 5m dwt (largely due to the weaker earnings outlook). Also positive for market balances has been a further supply side adjustment related to downtime associated with vessels being retrofitted with scrubbers. It must be highlighted, however, that the upside impact will be marginal at best. Data on the number of ships fitting scrubbers is patchy; MSI takes assumptions on total number of vessels with scrubbers fitted, differentiating between new tonnage delivered with scrubbers and existing tonnage being retro-fitted. Overall, we anticipate 40m dwt will be retrofitted this year, more than half of which will be in the 120,000 dwt Capesize bracket. Estimates on the time taken to fit scrubbers vary. For some vessels fitting a scrubber can take place during special survey, but for most ships retro-fitting scrubbers, this will require an unscheduled period off hire. MSI assumes two weeks off-hire required to fit a scrubber on average, noting upside risk should vessels have to deviate from trading routes by more than expected. All told, we calculate that the annual average dry bulk supply will be 1.5 Mn Dwt lower in 2019 as a result of vessels retro-fitting scrubbers, with 120+ Dwt supply 0.85 Mn Dwt lower (or equivalent to the loss of just five Capesize ships on average for the year). In our Base Case, 2019 will be the peak period for retro-fitting scrubbers. This is underpinned by a consensus view that high/low sulphur bunker price differentials will be at their widest in late 2019/early 2020 as the regulations take effect; owners/charterers investing in scrubbers will be keen to capitalise on this. We forecast 0.5m dwt supply lost in 2020 as a result of scrubber retrofits during that year. In summary, the significant drop in demand directly resulting from the loss of Brazilian iron ore exports will be partly offset by a number of other factors, but most of these positives will be in the sub-Capesize markets. As a result, our forecast for the aggregate dry bulk fleet employment rate this year has not been as dramatically cut as might have been expected given the prevalence of negative news. Chart 2 compares our latest Base Case view against the previous forecast – at 84%, the employment rate is close to 2017’s average, and far higher than the very weak period during 2015/16. Also notable from Chart 2 is the change to our employment rate cycle, with 2019 now marking the lowest point in our five-year outlook. 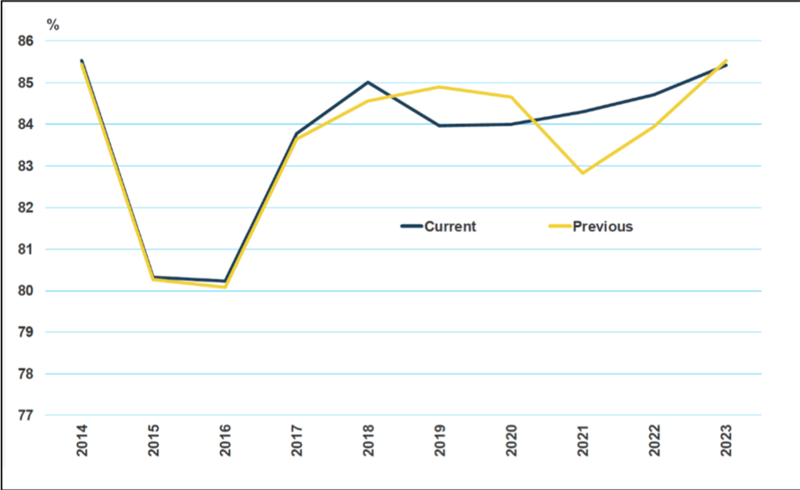 This is driven by the significant change to our forecast for iron ore trade and also an adjustment to supply – higher scrapping in 2019/20 than previously forecast is positive for market balances in the medium-term. MSI’s updated forecast for bulker timecharter rates is aligned with this new fleet employment rate cycle. The weakest period in our 1 year timecharter forecast is now in 2019/20, and we’re expecting yoy increases from 2021-23.